A BMW employee performs the final checks on a BMW 6-series cabriolet at the plant in Dingolfing, Germany, in a March 2011 photo. 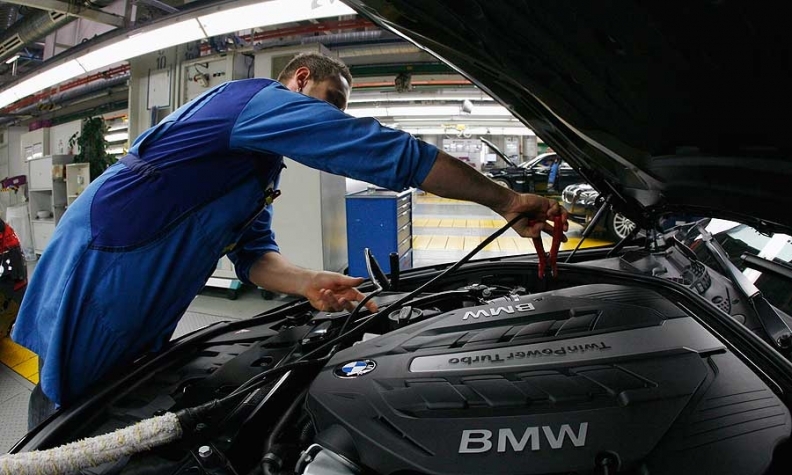 BERLIN (Bloomberg) -- Five years ago, BMW managers realized that with Germany's graying population the average age of their workers would jump from 41 to 46 by 2017. So they decided to make it happen sooner. In 2007, the luxury automaker set up an experimental assembly line with older employees to see whether they could keep pace. The production line in Dingolfing, 80km (49 miles) northeast of BMW's Munich base, features hoists to spare aging backs, adjustable-height work benches, and wooden floors instead of rubber to help hips swivel during repetitive tasks. Like BMW, Germany's other automakers are grappling with an aging work force. With the country also facing a shortage of qualified engineers, many in the industry have decided that its best to keep good workers on the job as long as possible by adapting factories to their needs. The problem is most pressing for luxury brands such as BMW and Volkswagen AG's Audi because the higher-end manufacturers rely more on labor than than volume manufacturers do. And there's little substitute for the experience gained by years on the assembly line. "A deficit of engineers and skilled workers is one of the major issues for German carmakers and will become acute in coming years," said Stefan Bratzel, director at the Center of Automotive Management in Bergisch-Gladbach, near Cologne. "So staff need to be kept fit on the assembly line." BMW says it implemented more than a dozen changes at Dingolfing, among them movable instruction screens with larger letters and a magnifying glass, and a two-hour rotation cycle to keep minds sharp by regularly switching tasks. "The 2017 assembly line became as productive as the younger one, but the quality was higher," said Jochen Frey, a BMW spokesman on personnel issues. At Audi, efforts to lock in skills have been extended to those with more serious ailments. At the department that packages kits of car parts to be shipped abroad for assembly at factories in India and China, nearly half the staff have some form of physical impairment, ranging from faulty vision to a balky hip. Alfred Kopold, 47, was forced off Audi's production line after knee surgery left him unable to sit or stand for long periods. Instead of leaving the company, Kopold moved to the kit-making group, where a customized work station allows him to constantly shift position. The department, which packages kits for models such as the A4 sedan, A5 coupe and Q5 sport-utility vehicle, also employs more flexible working practices and measures contributions across the mixed-age work force rather than individually. With the changes, the department's productivity jumped by 40 percent between 2005 and 2010, and it now has 96 percent of the output of a totally healthy team, according to its head, Hartmut Bartsch. The "ultimate goal," Bartsch said, is to ensure that even those confined to wheelchairs can do the most demanding jobs. Audi has also grouped older workers together with young recruits to aid the transfer of the "implicit knowledge" that is central to many car-making processes, said Dietmar Frassek, an Audi project manager for human resources policy. In Audi's tooling department it can take a decade to hone the senses well enough to be able to run a hand over a metal surface and detect minute flaws. "In the press plant, for example, there are many variables such as temperature and the mixture of materials, and infinite options for combining them," Frassek said. "Only experience can ensure optimal results." At Porsche AG's base in the Zuffenhausen area of Stuttgart, where the 911, Boxster and Cayman are made, older engineers were recruited to work on the 918 Spyder, a hybrid super car that will be the automaker's most expensive model ever when deliveries start late next year. Daimler AG, where staff will average 47 years old by 2020 versus 43 in 2010, is in a dispute with unions over age-related issues. The company is asking for contractual changes in return for factoring age into a system of classifying the physical demands of various jobs. Daimler is seeking concessions on pay and future consultation in return for minimizing or eliminating the toughest procedures, said Erich Klemm, the head of the Daimler's works council. Klemm says the dispute has delayed plant upgrades. At Daimler's Sindelfingen factory, near Stuttgart, the unions want car bodies to be lifted so workers won't need to bend into a moving production line when inserting cable harnesses. While Klemm acknowledges it would cost a "few hundred thousand euros" to modify 10 workstations, he insists the change would save Daimler money in reduced sick leave. "It's in the company's interest," he said. Daimler declined to comment on any statements by the works council, but said that its job classification system is fair. Even with such measures in place it's impossible to overcome the impact of aging for some staff, said Joachim Stork, a medical doctor and director at Audi's health department. Yet Stork is confident that technology may someday narrow the gap between the capabilities of an aging work force and the demands of even the toughest factory jobs. "We can counteract the rising age and necessities of staff with innovations," he said. "To solve the conflict between the aging process and productivity will be a permanent task."